We live in a world with less and less wild, natural areas. This results in fewer food source plants for bees. We can help pollinators by increasing bee habitat areas. One way to do this is to turn problem areas of our yards into bee friendly gardens. In addition to using less commercial fertilizers and chemicals on our lawns, we can do more. Some homeowners have problems with erosion. These areas channel water and wash away soil during rainy times. Then may hold standing water for days and breed mosquitoes. Lets turn this “problem area” into a bee habitat help our bees. Do you have an area of your lawn that is a wash zone or soggy location? You can make a rain garden using plants that help hold the soil. And, that can withstand periods of wet soil. A good design means less mowing in difficult places. And best of all, adding just a few new blooming plants will add more nutrition to our bee habitat. Choose several different types of flowers. It is a good idea to choose plants that provide food for bees throughout the season. Your effort contribute to pollinator health and honey bees are not the only ones who will benefit. Butterflies, hummingbirds, moths and many solitary bees and wasps need good nectar sources. Do You Really Need More Grass? Want to add even more diversity to your bee habitat? Don’t forget about trees. If you have room for small blooming trees, you can add one to your rain garden too. Red Maple, Evergreen Pear and Black Gum are just a few to consider. Rain gardens or any type of plants for bee habitats reduce erosion. These planting areas handle runoff water created by heavy rainfall or thunder storms. By slowing rushing water, the bee garden encourages water to sink into the soil and not end up in a sewer. Best Plants For Your Rain Garden for Bees ! The number of planting options are almost endless and limited only by your gardening zone. Know your zone.! Plants that are suited for a dry warm climate in Arizona may not do well in Maine ! A bee habitat garden design featuring plants of different heights provides depth and creates a sense of space. Regardless of your garden layout, you will not be happy with the results unless you have the right plants. Choosing plants that are suited to your climate is important because you want the garden to look pretty year round. To help bees, your rain garden plants should bloom over a long period of time. Bees like plants that provide nectar, pollen or both ! Check with local gardening centers in your region for help with plant selection. You should be able to find a good selection of different colors to compliment any garden design. The decline of honey bees and other pollinators is the subject of many news stories. As more acreage is developed for housing and businesses, natural habitat is lost. This results in a lack of food for beneficial insects. Concerned citizens nationwide are looking for ways to help our troubled insects. Honey bees, Bumblebees and other insects can benefit from an increase in available flowering plants. And, yes – you can make a difference! One small garden may seem unimportant. However if everyone in the neighborhood participates by adding blooming plants, this can make quite an impact on the area. 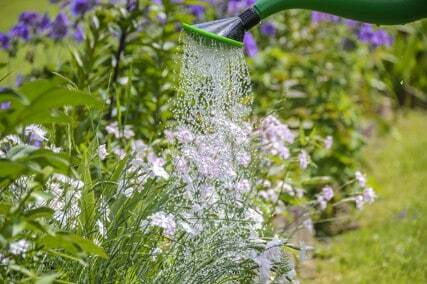 If you would like to know more about planting a rain garden, check out this link. A garden for pollinators. Make a big difference. Choose pollinator friendly plants that will help bees for all your landscaping projects. And in some spaces, you may use plants that benefits the bees and you too. Bee Habitats are easy to create and they don’t have to be large in size. Even a few pots can help. Learn more.